LONDON, England (CNN) -- British Airways plunged into the red in its third quarter, posting a pre-tax loss of £70 million ($102.4 million) for the nine months ending December 31. 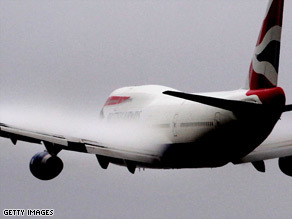 BA confirmed it is heading for an operating loss for the full financial year. This compared to an £816 million ($1.19 billion) profit for the same period last year. The carrier, which revealed last month that it would make a £150 million operating loss for the full year due to a weak economy and declining sterling, said in a statement Friday that it was increasing sales activity in areas where currencies were strong, while also reviewing its cost base. Fuel costs were up almost 50 percent at £2.2 billion as rocketing oil prices -- sparked by last year's record high of $147 a barrel -- have had an adverse affect on the airline industry as a whole, with a number of carriers forced into bankruptcy. On Tuesday Swedish airline SAS announced it was cutting 3,000 jobs and selling off several of its stakes in other airlines after unveiling poor fourth quarter results. However, the airline confirmed it was talking to staff unions about "pay and productivity" as it continues to rein in costs soaring costs. British Airways' chief executive Willie Walsh said: "We have already taken several actions to offset the unprecedented economic conditions. "We have increased our sales activity in markets with stronger foreign currencies to benefit from exchange and continue to offer competitive fares in both premium and non-premium cabins. "We continue to review every aspect of the business to control costs while at the same time improving the customer experience and operation."